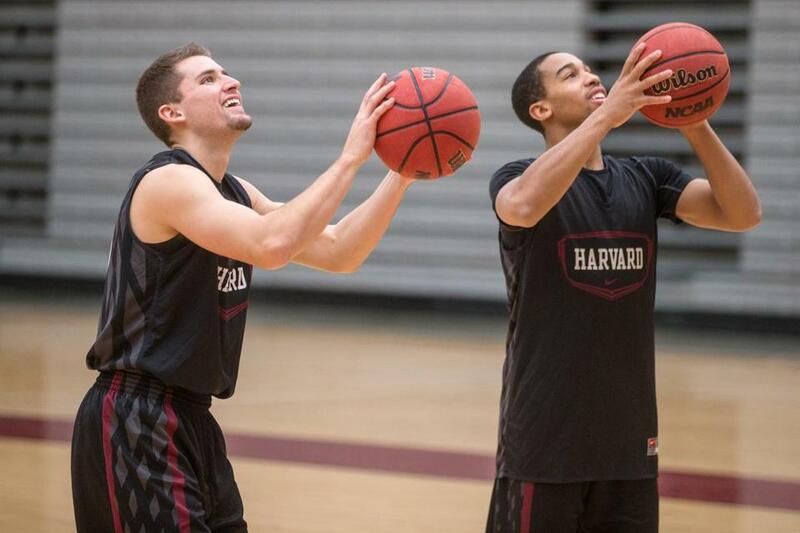 Corbin Miller (left) is glad to be rejoining his Harvard teammates, such as Siyani Chambers (right). Two years ago, Corbin Miller found himself some 2,000 miles from his family in Utah, 3,000 miles from his basketball team at Harvard, and about 80 miles outside of Mexico City in the mountains of Puebla, and he didn’t know a word of Spanish. It was exactly where he wanted to be. He had just finished his freshman season at Harvard. The Crimson had won their second straight Ivy League championship. But basketball was the last thing on his mind. Taking a mission trip for the Church of Jesus Christ of Latter Day Saints had been important to him since he was a boy. He saw a world beyond basketball and wanted to give as much as he could to it. He wanted to reach people, help people, touch people. But first he had to speak to them. That’s where his companion, Elder Millan, came in. In the two years Miller spent in Mexico, he picked up more and more of the language. He also picked up more and more of the culture. He hopped from Zacatlan to San Lorenzo to Tlaxcala to Puebla, meeting families, learning their stories. Some towns had no gas stations, some homes had no floors, and in two years he saw only two hardwood basketball courts (otherwise, the playgrounds replaced hoops with soccer nets) but he saw joy in the people. “A lot of places we’d go, we’d walk an hour to places through fields, through ranches, through farms,” said Miller, who returns to the Crimson this year after completing his mission. “Just incredibly humble people. Great people. Always welcomed into their home. For two years, Miller traveled through Mexico spreading the word of his church and looking for opportunities to serve. “We’d be out on the streets talking to as many people as we could,” he said. “If we’d see someone who needed help with something, we’d stop and go over and see if we could help. Based on basketball alone, there were more than enough reasons for Harvard coach Tommy Amaker to fall in love with the 6-foot-2-inch shooter from a little town outside Salt Lake City. At Brighton High, Miller made it look easy. He once drained eight 3-pointers in a game to tie Utah’s state record. Then he did it again the next game. But there was more, and Amaker could see it. “He also wants to be a part of something that’s even bigger than himself,” Amaker said. From the moment the recruiting process started, Amaker saw someone who viewed the world beyond the lines on the hardwood. Miller saw cultures outside his own, people in circumstances less fortunate than his. He had a sense of spirituality that he was committed to sharing with others. When Amaker met with Miller and his parents, they talked about it all. “We recognized and knew his commitment to his faith and his religion when we recruited him,” Amaker said. Miller told him that, at some point, before or after he enrolled at Harvard, he wanted to take a mission trip with the church. “It’s something that’s extremely important, that I believe in and wanted to do,” Miller said. Amaker not only understood, he embraced the idea. It was something he wanted sewn into the fabric of the program he was building, even if it meant Miller would be away from the team. “Bringing those lessons to our team and our program — which we always try to teach that aspect, getting outside of yourself for the sake of others — there’s a powerful force there that he’s been a part of,” Amaker said. “We knew that from the beginning, that he has those kinds of layers to who he is. Miller came to Harvard for his freshman season in 2011, played in 28 games, drilled 26 of his 57 3-point attempts, then put basketball on the back burner. He set out on the two-year journey through Mexico, training missionaries and reaching out to families in some of the country’s more poverty-stricken areas. He returns to Harvard this season with a role to fill on the floor, but with a broadened perspective to add off it. “Corbin’s a very competitive person, but he’s a very compassionate person,” said his father, Bret. “The competitiveness is when he’s playing sports and the compassion is who he is outside the basketball court. He’s just always had a desire to help people. Taking a mission trip was something Miller always had planned on doing. They wanted him to work to help others. “A lot of times, people see Mormon missionaries coming down the street and they think, ‘They’re at it, they’re forcing it, you’ve got to listen to them, they want to convert you, they want to baptize you,’ ” Miller said. He focused on what he could control, on the people he was able to reach. One woman, Fidela, made as much of an impression on him as he did on her. She was quiet and slight, not even 5 feet tall, he remembered, a single mother in her 60s. She had a 35-year-old son who was disabled. She took care of grandchildren as well. Her son couldn’t walk but didn’t have a wheelchair. She took it upon herself to get him wherever he needed to go. “She would carry her son,” Miller said. “She would carry him to church, she would carry him to the doctor. He was far away from the world he knew and the comforts that came with it, but he became close to the people he met. When he left, he made sure to keep in contact. There was only so much Miller could do to stay in touch with the world he left behind. He would e-mail his family weekly and constantly check in with teammates. But he could only actually talk to them twice a year. He would Skype with his family on Mother’s Day and Christmas. “That one’s the hardest one on the moms,” Bret said. Cathy kept all of the e-mails and photos that Corbin sent and made them into a journal. “It’s fun to look back and remember all of those experiences he had,” she said. Amaker posted his messages to the team in the locker room. Miller is the middle of five children. One of his brothers, Brandon, who is signed to play for the University of Utah, went on his own mission to New York. His youngest brother, Brock, will be a senior this season and just committed to play for Utah State. Miller’s extended family went out to the airport in late March to welcome him home. Bret couldn’t help thinking about how much time had flown by. When Miller left on his mission, his younger brother was about 6 feet tall. When he came back, that brother had shot up to 6-5. When he left after his freshman season, Miller was 180 pounds. When he got back, he was down to 160 pounds. He spent five months working out with his brothers, getting his body back in basketball shape and getting his weight up to 185 pounds. While he was away, Miller kept a close eye on the Crimson, who won two more Ivy League titles and shook up the NCAA Tournament, putting Harvard basketball on the national radar. After beating Cincinnati in last year’s tournament, the Crimson will come into this season as the No. 25 team in the country, the first time in 40 years an Ivy League team has been ranked going into a season. As a player and a person, Miller will bring an added element. “Basketball, I think, has always been extremely important, but I think now I see it kind of in the bigger picture of things,” he said. “I think basketball for a lot of us can be used as more of a means to an end.